There are a million things I love about living in Florida — beach access, great winter running weather, the fact that I rarely go anywhere that requires more formal footwear than sneakers or flip flops, for example. So, when I have a chance to get out of town during the summer months and go somewhere mountainous and maybe a bit cooler, that’s kind of a no-brainer. When that happens to be someplace I can get to within half a day — without even changing time zones — hey, even better. And with that in mind, let me tell you about an absolute East Coast gem: Virginia’s Blue Ridge. 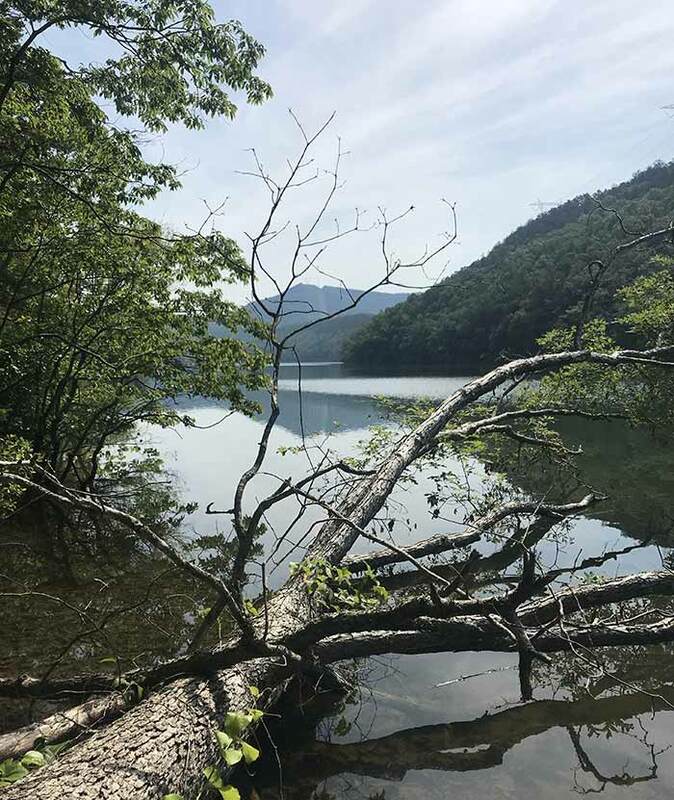 I was invited on a media tour to the area last month (my travel, accommodations, meals and activities were covered, but everything you read is strictly my opinion) — you might’ve seen my recap of a few of the area breweries — and I took my first step on the Appalachian Trail. You can 100 percent take my word when I tell you it won’t be my last. So, if you’re looking for a fun, outdoorsy getaway, you might want to move Roanoke to the top of your list. 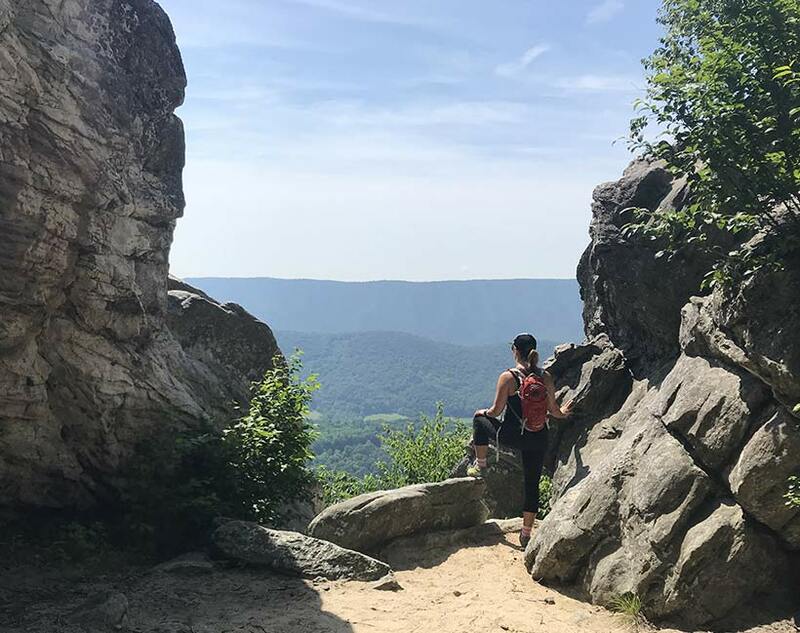 Here are a few awesome ways to get sweaty in the Blue Ridge Mountains — and everything listed below is just an easy, maybe 20-30 minute drive from the city. I only had a chance to do two of the three hikes that make up the Triple Crown of Virginia, but the way I see it, this just gives me an excuse to go back. The Triple Crown consists of Dragon’s Tooth, McAfee Knob, and Tinker Cliffs. Each hike is a worthy adventure in and of itself, so if you’re interested in a variety of day hikes, you can knock them out one at a time — either hitting one per day or, if you’re speedy, fit and motivated, doing one in the morning and a second in the afternoon. Or, if you want to hit all three without heading back to civilization, you can complete the Triple Crown as a loop, camping in overnight in one of the designated spots (which you can find on this map) along the way. But, in case you can only check out one or two, let me break down these incredible hikes for you. 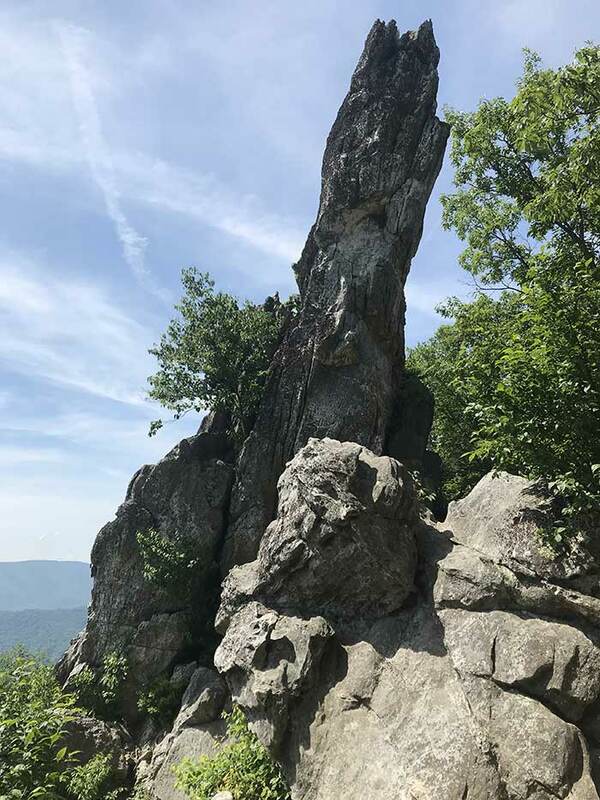 Dragon’s Tooth: While this hike isn’t terribly long — just 4.6 miles out-and-back — it’s not for the faint of heart (or for anyone not ready to get good and sweaty, because after this one, I was DRENCHED). The elevation gain is decent to start, but the trails don’t become too challenging until about 1.5 miles in — at that point, you’ll find yourself doing a fair bit of climbing and bouldering and using iron climb bars that are strategically placed to give hikers a boost (and, in some of my more dramatic moments, they seemed to keep me from plummeting to my death — but nobody else seemed too concerned so I think this is a slight exaggeration on my part). Because I’m deathly afraid of heights, there were parts of this that required me to summon all my courage (and to avoid thinking about coming back down), and I was very happy to have a guide and other hikers ahead of me to help me plan my route — so fellow acrophobics, keep this in mind. I saw people making their way up with small children and … I’m not sure I would recommend that, to be honest. At the top, there’s shade, gorgeous views, and — most notably — “The Tooth,” which is a 35-foot tall quartzite rock sphere that seems to reach toward the sky. Other members of my crew climbed up into the tooth and said the views became even more incredible, but, since I’m a giver (and also was way too scared to climb up anything beyond what I’d already done) I volunteered to stay down and keep an eye on everyone’s stuff. McAfee Knob: This is the most photographed spot on the AT, as well as the trail’s most popular hike (so, if you have the option, head there on a weekday rather than a weekend because parking at the trailhead can be problematic on a nice Saturday). It’s approximately 8.8 miles out-and-back with a gradual ascent that makes it accessible for anyone willing and able to make steady progress for four or five hours, even if they don’t have much in the way of technical expertise (like yours truly). The elevation gain is 1,700 feet, and the peak is at 3,197 feet — and it’s the peak that makes this hike so memorable, so if you’re smart, you’ll pack a lunch (and maybe a beer from a local brewery) to enjoy at the top. And let’s discuss the top for a second, because it’s truly extraordinary. 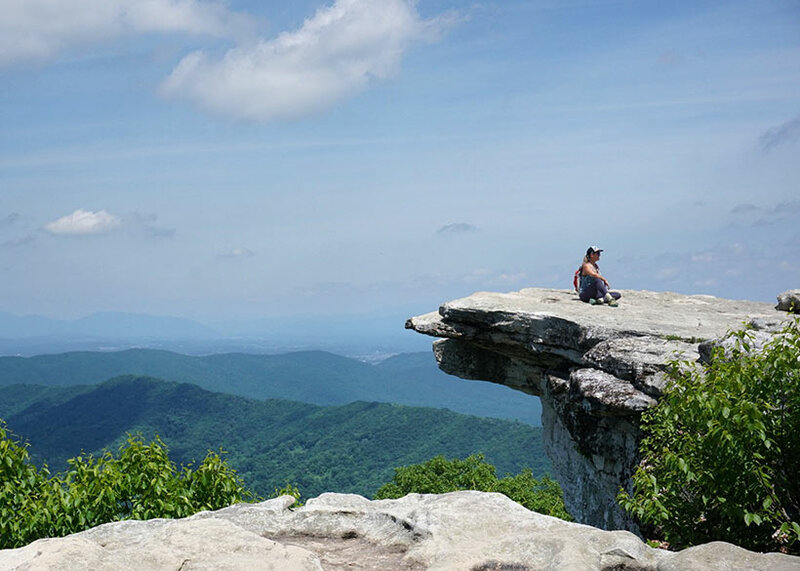 Located at the top of Catawba Mountain, McAfee Knob offers 270-degree panoramic views of the mountains and valleys in the area — and a quick glance makes reason for the “Blue Ridge” moniker obvious, because it all appears to be varying shades of blue. The spot’s signature ledge had our entire group grabbing their cameras and striking poses, because, although there are steep drop offs nearby, it’s easy to snap a stunning shot that makes it look like you’re near the edge without actually coming close. (Trust me on this.) If I had one day in the Roanoke area, hiking McAfee Knob would be the first item on my to-do list. Tinker Cliffs: I missed out on Tinker Cliffs, which is a 7.7 mile out-and-back with 2,000 feet of elevation gain. The cliffs themselves are made of limestone that’s more than 250 million years old — and truly stunning, from what I’ve heard. At the top, you’ll be at an elevation of 3,000 feet with a fantastic view of the Blue Ridge Mountains (including McAfee Knob). Now, while none of these trails are extremely long, it is important to bring plenty of water, because you’re looking at a few hours of steady work no matter what. And it’s also important to keep the Leave No Trace principles in mind and plan appropriately for your garbage, including food leftovers. 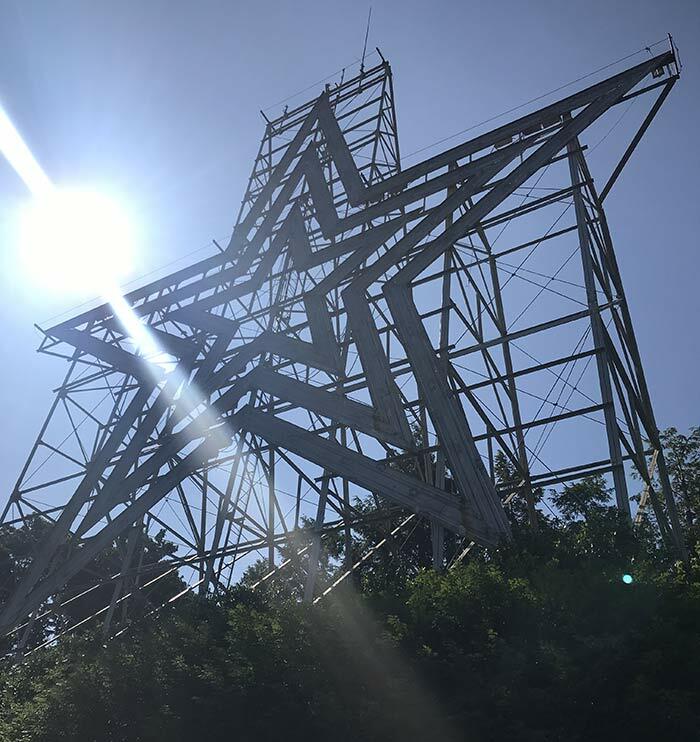 The aforementioned hikes might be the big three in the area, but Roanoke has more than 600 miles of hiking trails, both on and off the AT, including one that takes you up to the Roanoke Star — the largest free-standing, man-made, illuminated star in the world. (Yes, that’s a lot of qualifiers, but it is legitimately impressive and the view from where it resides on Mill Mountain is worth a visit on its own.) You can drive right up to the top if you’d like, or you can hike — or bike — the Mill Mountain Star Trail, a 3.7-mile out-and-back trail with just 813 feet of elevation gain. If you’re hiking with kids or dogs or anyone who’s unsure about tackling one of the challenging AT hikes, this could be a great way to get a few miles in without going overboard. In addition to having loads of hiking trails, Roanoke has also been named America’s East Coast Mountain Biking Capital and is certified as an International Mountain Bicycling Association (IMBA) Silver-Level Ride Center — and yes, this is a huge deal, because there are only 15 of these in the world, and this is literally the only one of the East Coast. One of the areas best known as a mountain biking mecca is one that I had the opportunity to check out (with my hiking shoes, not on two wheels) — Carvin’s Cove. This area alone has almost 70 miles of trails, mostly for intermediate to advanced riders, although I walked along a good portion that was more inline with gravel biking — and I’m told that more beginner-friendly trails are being cleared right this moment, and the IMBA Ride Center is developing areas to encourage more people to give mountain biking a try. Hiking is beginner-level, with pretty views of the lake and easy to follow, well-maintained trails — you’ll just want to be on the lookout for cyclists and give them the right of way, which can be a little disorienting on some of the singletrack areas with a bit of a steep hill to the side. No doubt you’ll find yourself hungry at some point, and happily, you have options. Some of the breweries are affiliated with food trucks or work with restaurants that deliver, so if you’re grabbing a drink, you can just ask them what they recommend. But, if you’re on your own, be sure to check out Wildflour Restaurant & Bakery (and plan ahead for dessert, because whoa, the cakes and cookies here are no joke), and I also heard wonderful things about Cedars Lebanese Restaurant, which sources almost all its non-perishable ingredients from Lebanon. And, if you’re itching for some classic, down-home southern style food — maybe a hearty breakfast to kick off your day — The Roanoker has been delivering on that front since 1941 (and yes, you should get one of the biscuits). Thanks for sharing Kristen. 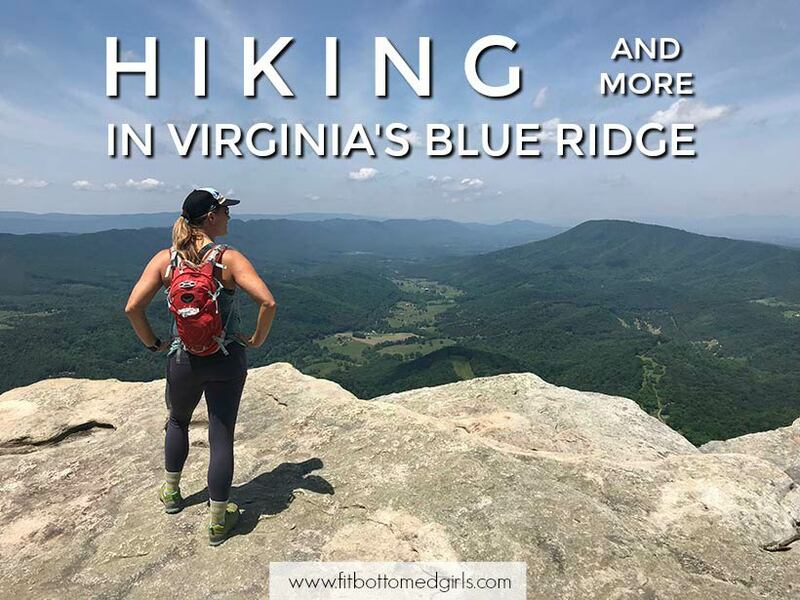 I have not been to Virginia’s Blue Ridge, but I have been doing a lot of hiking this summer, and my husband and I are planning to visit all 50 states once I retire, so we are building a list of things to do in each state. Blue Ridge just made the list! I’d have to say Kauai, HI is one place that just dropped my jaw. Looks so beautiful there!!! Would love to do more hiking around America! Wow!! What a beautiful location.